And I decided why not to share the process of how I’ve fixed this issue publicly. 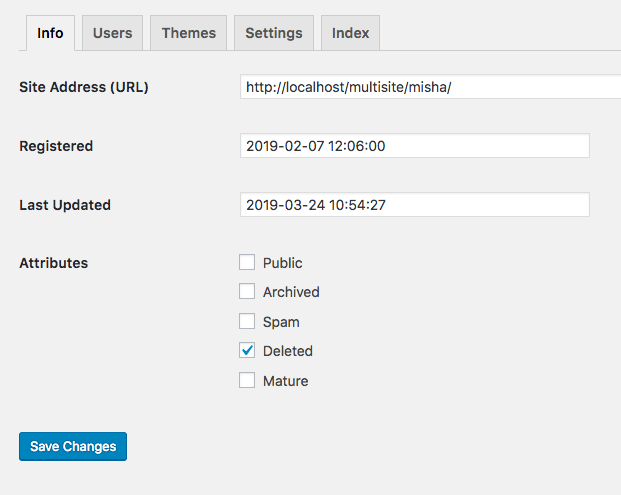 What is the Difference between Deactivated and Removed Sites in WordPress Multisite? But before we dive into action hooks replacements, it is critical to understand a difference between these two things. When you Deactivate a website within your multisite network, it won’t be removed from the database, if you Delete it, its database tables will be dropped. “Multisite Posts” menu link is also a part of my plugin. If you turn it on in plugin settings, on that page all the posts/post_types from your network will be displayed there. But if you open a website settings page, you will see a Deleted attribute, if you check it, the website will be deactivated, not removed. So when a website either deactivated or deleted, both delete_blog and deleted_blog were fired before 5.1.0 version, the difference is just in the second parameter $drop, which is false for deactivated websites and true for deleted ones. This action hook was fired before a website is deactivated/removed, as I said the difference between these two actions was in $drop parameter. Since WordPress 5.1.0 we can easily replace the above action hook with two other hooks, the first one, wp_uninitialize_site will be fired for deleted websites. And wp_update_site hook – for deactivated websites. Never forget about the condition statement (line 2), because the acton hook will be fired for any website status changes and not only. Please note, that the new hooks accept not a $blog_id parameter but a whole WP_Site object, you can get a blog ID from the object easily – $blog->blog_id. This hook was fired after a website is completely deleted from database. And we can replace it with wp_delete_site – for deleted websites and wp_update_site for deactivated websites. I’ve already described the second hook wp_update_site above, so that’s all.